346. 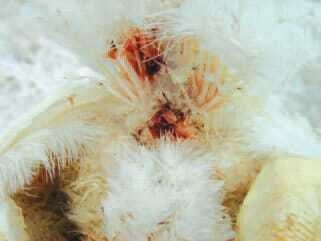 Coccidiosis is a common protozoan disease in domestic birds and other fowl, characterized by enteritis and bloody diarrhoea. 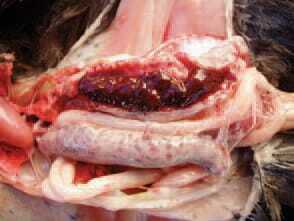 The intestinal tract is affected, with the exception of the renal coccidiosis in geese. 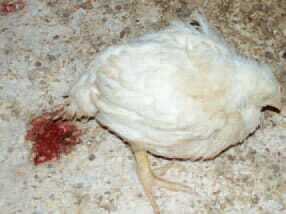 Clinically, bloody faeces, ruffled feathers, anaemia, reduced head size and somnolence are observed. 347.The area around the vent is stained with blood. 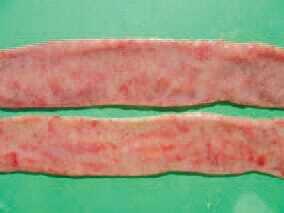 The infection is realized by a faecal-oral route. 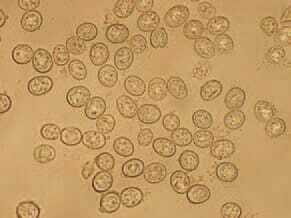 After ingestion of sporulated (infective) oocysts, sporozoites are released that enter asexual and sexual cycles of development resulting in the emergence of thousands of new oocysts in the intestines. Oocysts are distributed by faeces. Soon, they sporulate and become infective for chickens. 348.The intestinal lesions provoked by coccidia, are due to injury of the epithelial cells of the mucous coat where the parasites are developed and multiplied. The oocysts exist in the litter in premises and are distributed by clothes, shoes, dust, insects etc. 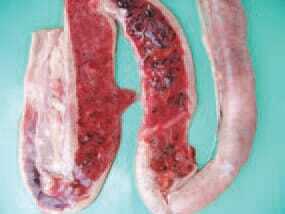 Pathoanatomically, dehydration and a high degree of anaemia of the body and viscera are discovered. 349.Anaemic appearance of internal organs. 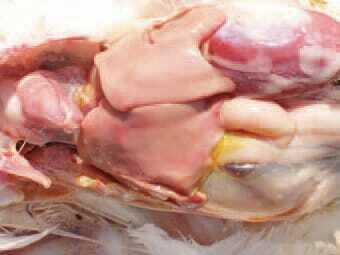 The wet litter and the heat in premises favour of the sporulation and therefore, the outbreak of coccidiosis. 350.351.Depending on the localization of lesions in intestines, the coccidioses are divided into caecal, induced by E. tenella, and small intestinal, induced by E. acervulina, E. brunetti, E. maxima, E. mitis, E. mivati, E. necatrix, E. praecox and E. nagani. 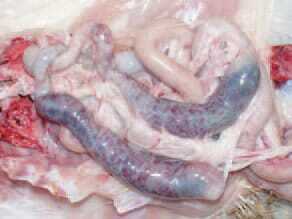 In caecal coccidiosis, a marked typhlitis is present and haemorrhages are seen through the intestinal wall. 352.The caeca are filled with fresh or clotted blood. 353.a later stage, the caecal content becomes thicker, mixed with fibrinous exudate and acquires a cheese like appearance. 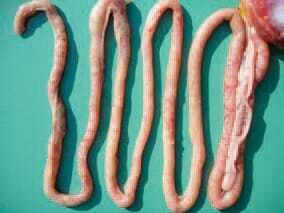 354.355.356.In small intestinal coccidioses, depending on the eimeria species, haemorrhages with various intensities in different parts along the intestine are observed. 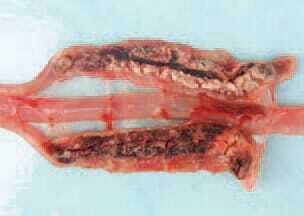 In many instances, the haemorrhages are petchial and could be seen through the intestinal wall. 357.Sometimes, a reation of the intestinal lymphoid tissue is present. 358.359.The content is mixed with fresh or clotted blood, and the mucous coat is mottled with multiple petechial or larger haemorrhages. 360.Histologically, Eimeria organisms at a various stage of development are detected in the epithelial intestinal cells. The diagnosis is made upon the results of the complex evaluation of the clinical picture, the macroscopic lesions, imprint preparations, histological study and flotation. 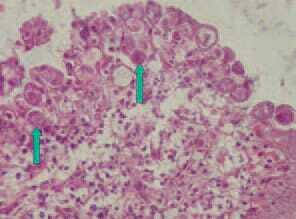 Coccidioses should be differentiated from NE, UE and histomonosis (typhlohepatitis). Treatment - sulfonamides are widely used: sulfadimethoxine, sulfaquinoxaline, I sulfamethazine, but they should not I be used in layer hens. The supplementation I of vitamins A and K promotes the recovery. 361.The microscopic examination of a native preparation of intestinal content or superficial mucosal layer reveals a significant number of oocysts in one observation field. Prevention. The use of coccidiostatics with forages on a rotation basis is the most extensively used means. The immunization against coccidiosis with commercial vaccines is used in broiler breeder flocks. If the chickens are exposed to the natural effect of a moderate number of oocysts in their environment, they develop immunity to the respective parasitic species.